The juxtaposition of images of the salmon's sordid entrapment on a Canadian factory farm, images of its spiritual fulfillment (or nullity) and the tensions between its instincts for freedom and return offer a concentrated motif for this remarkable collection. In making his own return of memory from Canada and South Carolina to a childhood and youth in 1970s Jamaica (in particular as a student of Jamaica College), Kwame Dawes' poems display a powerful narrative thrust, an appealing sense of humor, a gift for characterization and an acute sense of time and place. Progeny of Air links inner personal experience and social and historical perspectives to mutually enriching effect. 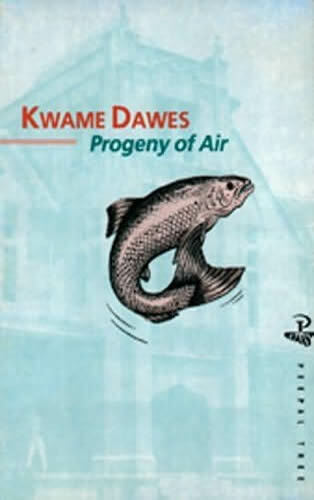 In a review for Poetry Review, Linda France wrote: 'Progeny of Air takes its title from a single poem describing a fishing trip, referring to the life cycle of the salmon, both actual and hypothetical. This also neatly reflects the themes and concerns of the collection: movement and the impulse of natural energy; the need to go back and revisit meaningful times and places in one's life; a way of living an authentic life, the possibility of growth and self-awareness. The leap and dash of the salmon is also caught in the poetry's musical rhythms and striking language.